Virtually every address on the internet is connected with each other with a protocol called as the Border Gateway Protocol(BGP), which dynamically routes traffic on the internet to the closest network. 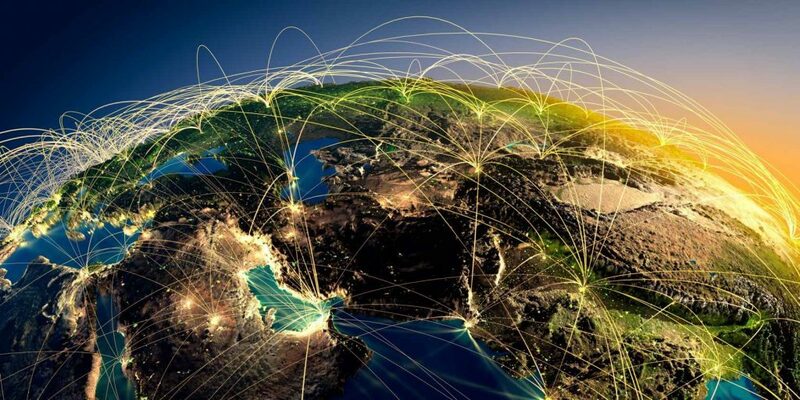 This guide will show you how you can be part of the internet for the cheapest possible cost. This guide is intended for sysadmins and network engineers, as such will not attempt to explain intricacies involved. There are various reasons why you may want to do this, including better control over traffic routing, cleaner IP range for things like running mail servers, more publicly routable IPs to use etc. So let’s get started! Maintainer objects will help you to manage objects(AS numbers and IP blocks) that you will be acquiring. APNIC – Asia Pacific region. LACNIC – Latin America region. ARIN – North America region. Note that some LIRs and IP leasing services won’t readily assign maintainers and would prefer to host the services themselves, which was fine for me as I didn’t have to update resources frequently. ASN(Autonomous system number) is an unique number given to IP networks on the internet, with the network having a clearly defined routing policy. You can do BGP with a private ASN and ask the upstream to filter out the ASN before announcing to upstream, but I decided to get my own so that I can be identifiable on the internet. To get an ASN, you will need to be sponsored by a LIR. The LIR should be a member of one of the Regional Internet Registry(RIR) in which you intend to apply for. Do keep in mind that some RIRs may want you to be multi-homed(have more than one transits or be present in multiple regions). The best way to get a list of LIRs which can sponsor you on the linked excel sheet or the follow this LowEndTalk thread. I would highly recommend getting IP space from the same company which offered sponsored your ASN request. Make sure the WHOIS reflects the correct information, including your email ID. RADB has a nice WHOIS tool. This would be required later to setup BGP peering. Do note that it is better to get your resources from a reputed LIR, or better yet directly from the RIR if you will be using the IP space for anything professional. The sponsorship/leasing model heavily relies on trust. I got my resources from hzr(Dylan N from Bandle City LLC), who has very good reputation in the LowEndTalk community. I’ve found him to be very responsive and helpful to any queries I had. You can email him on operations@bandlecity.org. Cost: Around 35 USD once. Could vary heavily depending on sponsoring LIR and region. You will need IP addresses that you can “announce” on the internet and hence claim to be yours. These can either be bought and transferred to you or you can lease them off an owner of the IP range. Since we are talking about doing BGP on a shoestring, leasing is the only model that works for us. Make sure the IP leasing service assigns the proper maintainer object or assigns proper ROAs, adds the correct WHOIS entry and rDNS. You will need a minimum of /48 for IPv6 and /24 for IPv4. I ended up skipping IPv4 since it was way too cost prohibitive. Just one IPv4 address given by my host is enough for me. Cost: Around 10-20 USD/year for a /48 IPv6 block, 60-70 USD/month for a /24 IPv4 block. There is an awesome spreadsheet which lists all known VPS providers which will do BGP for you for free or for a nominal cost. Many of them are quite happy to do custom things that you may want like connection to an Internet Exchange(IXP) or BGP communities or announcements to selective upstreams. You can also buy IP transit directly for more industrial applications. I’ve heard Hurricane Electric even gives free IPv6 transit at certain locations. I couldn’t confirm if this is true. Do keep in mind that you will need to have matching upstreams or control routing with BGP communities incase you are planning to do IP anycast. Also you will need enough memory to hold the full internet routing table if you are requesting one. Otherwise you could just ask for the default route. The awesome thing about Vultr is that they do BGP for even the lowest plan and the whole process is very automated. First Root is recommended as well since they have attractive pricing and great support. Cost: 5-10 USD/month depending on the resources you want. To announce BGP, you will first need to validate your resources and write a Letter of Authorisation(LOA) to authorise that you own the resources and that you give the host permission to announce them. This will depend on each particular host, but most hosts ask you to send a LOA from the email on the WHOIS for the resources. Something like this would work. As the owner of the subnet and ASN, I hereby declare that I’m authorized to represent and sign for this LOA. Should you have questions about this request, email me at me@varupriolkar.com, or call: +91XXXXXXXXXX. After this, the host should setup BGP for you and give you details like which IP to connect to. You would also need to pick if you want the full BGP table or just the default route. Typically the default route should be fine. To setup BGP, I installed bird and bird-bgp packages on Ubuntu. A basic setup should look like this. Vultr has a nice guide for configuring BGP. Then all you have to do is run systemctl start bird/bird6. You will also need to open TCP/179 port on your firewall. There’s a useful guide on NLNOG website for setting up more BGP filters. You will have to use looking glass from the transit providers to check if your prefix is getting propagated correctly. I used Hurricane Electric’s Looking Glass. You can also use Oregan Route Views project to get a more complete picture. Hurrican Electric also has a nice BGP view tool through which you can check the route propagation. Then all you have to do is simply assign an IP to an interface and see if it pings. Reverse DNS zone will need to point to your name servers. You can either set this up yourself or host it on DNS providers like Amazon’s Route 53 or DNS Made Easy. Reverse DNS zone will be the IP in the inverted format followed by the appropriate suffix. For eg. for the IPv4 prefix 1.2.3.0/24 the reverse zone will be 3.2.1.in-addr.arpa. and for the IPv6 address 2401:f9c0:1111::/48 the zone will be 1.1.1.1.0.c.9.f.1.0.4.2.ip6.arpa. You will also need to configure the appropriate PTR record. For IPv4 address this will be 1.3.2.1.in-addr-arpa. for the IPv4 address 1.2.3.4 and 1.0.0.0.0.0.0.0.0.0.0.0.0.0.0.0.0.0.0.0.1.1.1.1.0.c.9.f.1.0.4.2.ip6.arpa. for the IPv6 address 2401:f9c0:1111::1. It is preferable that the reverse record matches the forward as well. 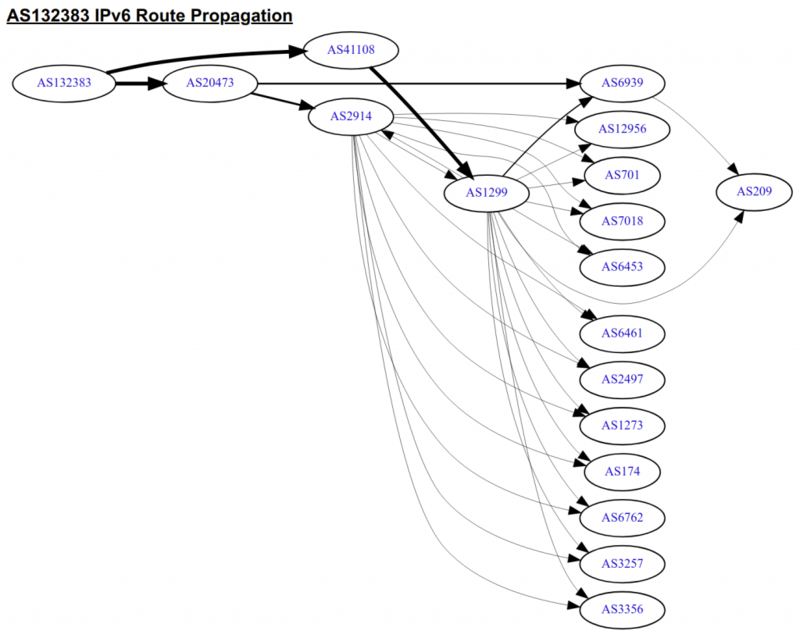 It can be difficult to set the reverse record for a huge range of IPv6 addresses. I found this project useful for that. Cost: 1 USD per hosted zone on Route 53, free if you are self hosting. BGPMon is really useful for this and free for monitoring upto five prefixes. 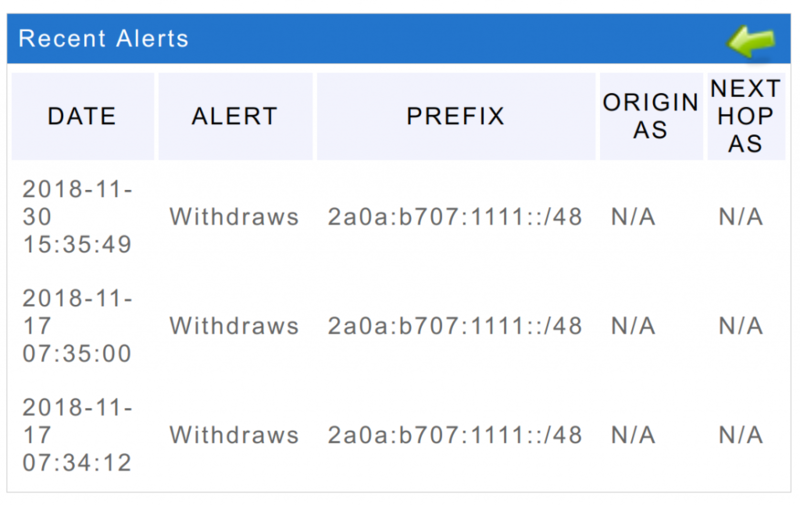 It will also send you email alerts incase it notices any flaps/prefix withdrawal. 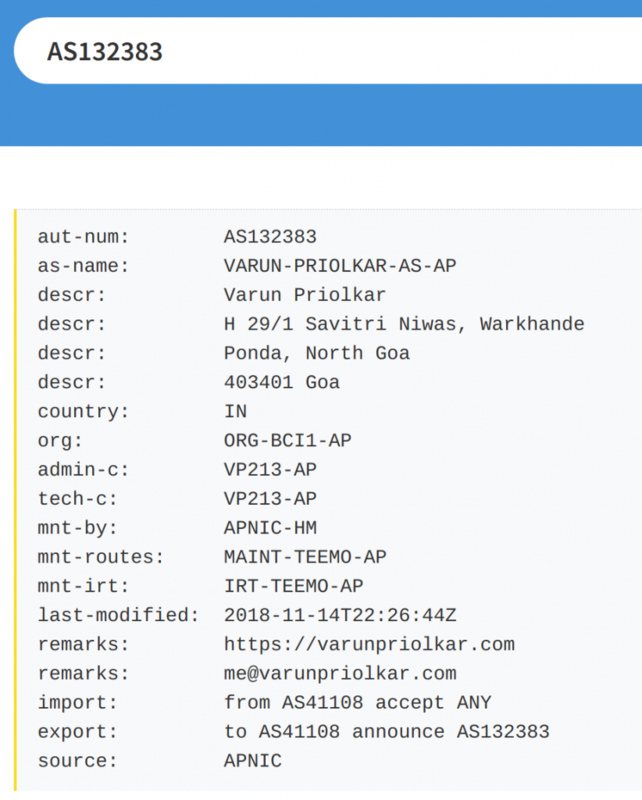 It also has a project called PeerMon which can allow you to peer with BGPMon routers and share your routes with it for it to detect any routing changes. I wouldn’t try it out because they had some capacity issues at the time of writing. Did you know you can setup a multihop BGP session with @BGPmon ? Cost: Free for upto 5 prefixes. rDNS hosting: 1-2 USD/month, free if self hosting. Total: 35 USD once, 7-15 USD/month recurring for IPv6, 65-80 USD/month for IPv4.